It was a good fight for Donnie “Ahas” Nietes as he overcame Moises “Moi” Fuentes’ deadly punches on a rematch at Mall of Asia Arena on May 10, 2014. He won by the way of technical knockout on the 9th round of the WBO light flyweight championship fight. Because of the big win by Nietes, his record was raised to 38 wins, 1 loss and 19 wins came by the way of knockout. This is a rematch of the fight between the two in 2013 that became controversial because the opinions of the boxing analysts were divided. This time, a rematch came true that tested the endurance of two of the best fighters of today in the said weight division. 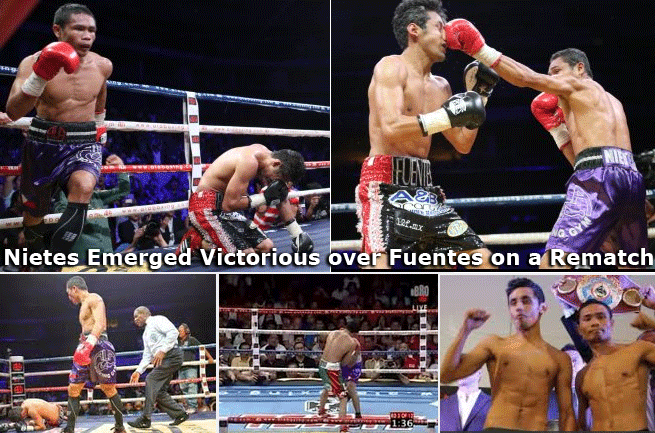 Fuentes told Nietes to fight like a man and he showed how to fight like a man by knocking him out 3 times on the ninth round that caused the referee to stop the fight. Because of the result of the fight, Nietes is close to walking the road the legend Gabriel “Flash” Elorde has walked before. He only needed to wait for 8 months in order to gain the title of being the Filipino boxer in the history who held a title for the longest time. Nietes defended his title well and fought intelligently in his fights that caused him to become undefeated since 2004. Nietes said during an interview that he adjusted a lot on the body punches because on their previous bout, he focused much on the head. He patiently fought for the knock out. Meanwhile, Milan Milendo and Rey “Boom Boom” Bautista also won on their fights being the undercards. Milendo won by majority decision while Bautista won by unanimous decisions.